development team for each switch / device family. CLI and unified Software Stack can be developed centralized with one team across different products. That enables faster development for new features and feature parity across different device families. Besides the benefit of exactly the same CLI on all devices that runs Denali Cisco has also added a new WebUI that is completely rebuild and has more features and a better usebility than the previous web interface. Costumers have demanded this for a long time and finally Cisco has responded with Denali. 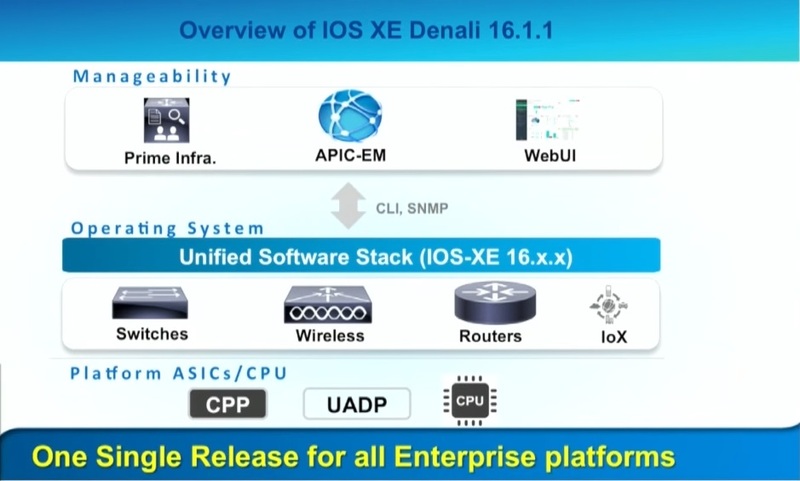 Thanks Cisco for releasing Denali. I have been waiting for this a long time. Besides Cisco internally all Cisco customers will benefit from this unified Software release approach. It makes tracking of software releases more easy and also the testing process. Cisco internally benefits also from a unified approach. I suggest that makes the development process faster and more efficient. At the end of the day hopefully the costumers get paid back with more new features that come out across multiple device platforms. I see here a general trend in the IT industry. It is needed to have an abstraction layer that is independent from the underlying hardware platform. Hopefully all new Cisco devices will follow this unified SW approach in the future.